One of the nice things about ‘reflactors’, like the ones shown here, is that they can be collimated just like reflectors – and at the fast focal ratios that reflactors typically work at, they’re likely to need it. 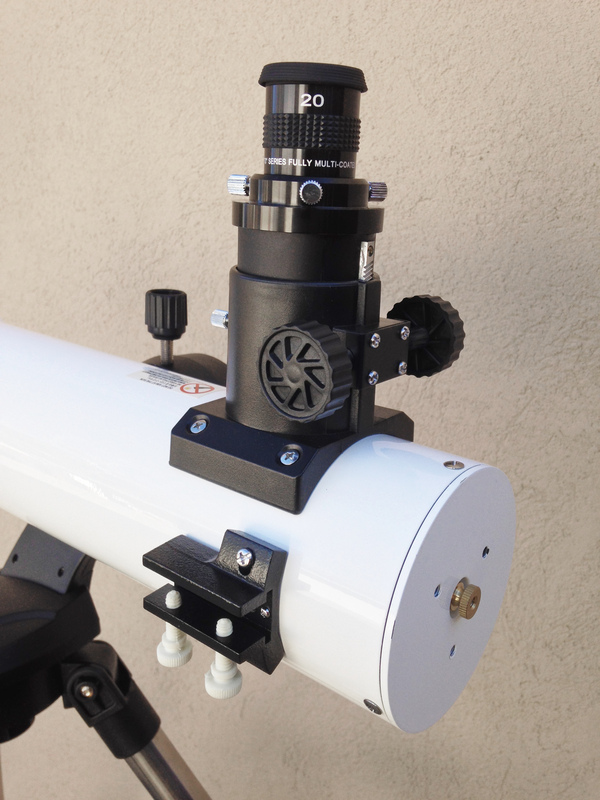 I don’t think I’ve ever blogged about collimation before. I haven’t blogged about how to do it because there are so many other sites that cover it already. I learned it myself from the book Astronomy Hacks by Robert Bruce Thompson and Barbara Fritchman Thompson, which is a pretty good book for anyone getting started with a telescope, and an absolute gold mine for anyone who owns a reflector. 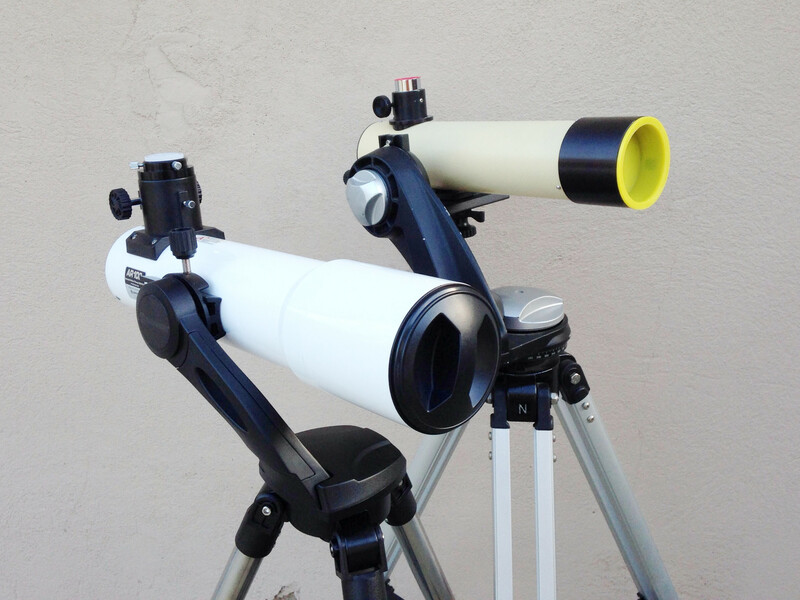 The Thompsons have nice step-by-step instructions, illustrated with photos, for making and using your own collimation cap, and for collimating using the Barlowed laser method. Collimation is one of those things that seems forbiddingly complex until you’ve done it a couple of times, at which point it becomes so routine as to hardly be worth mentioning. In conversation with other amateur astronomers I usually compare it to changing a baby’s diaper – awkward and probably terrifying the first time or two, and a complete non-event the next thousand or so times. The Badger and the Ferret both have Allen bolts on the back ends of their OTAs that look pretty much the same as those on the spiders of Newtonian reflectors. The central bolt controls the distance down the tube and the rotational facing of the diagonal mirror, and the three perimeter bolts control the mirror’s tilt. You can use a Cheshire sight tube or collimation cap and collimate a reflactor just like you’d do a reflector. You can also use the Barlowed laser method, which is what I did. 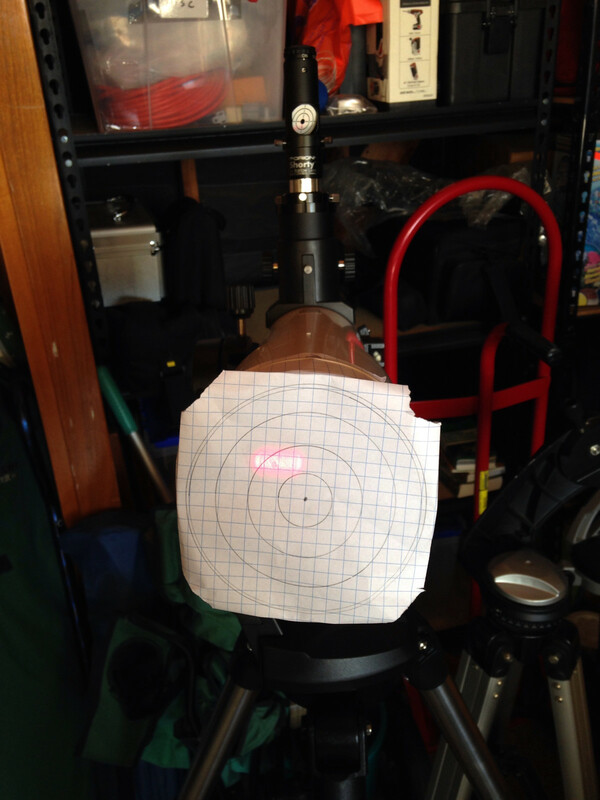 Draw a set of concentric circles on a piece of graph paper to make a collimation target, and rubber-band this over the front of the scope. 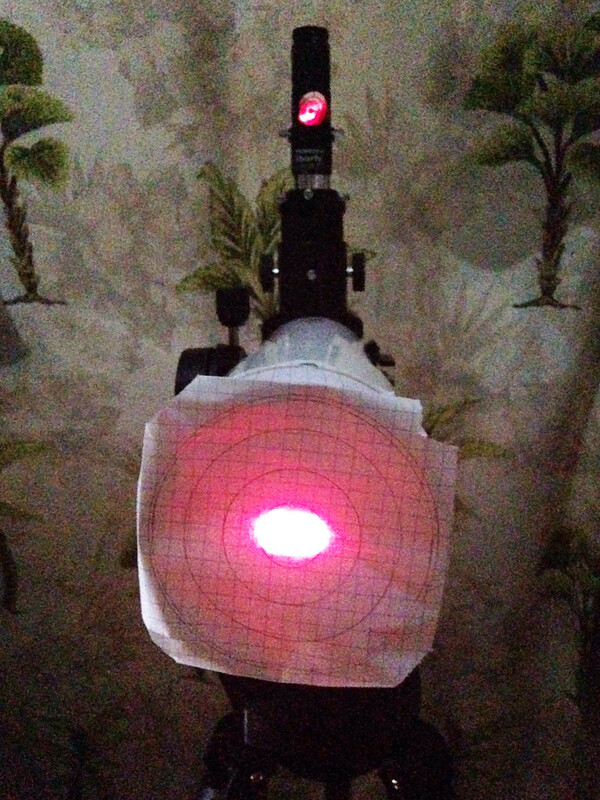 Pop a laser collimator (or any laser, really) into a Barlow lens and see where the beam lands. Adjust the rotation and tilt of the mirror until the beam is centered. I did the first bit in my garage, which is why there’s so much crap in the background of the first photo. Then I realized that it would be a lot faster and easier if I could see what was happening to the beam while I adjusted the collimation bolts, so I carried the whole rig inside the house and into the bathroom and pointed it at the bathroom mirror. Once I had the collimation spot-on, I spun the scope a quarter turn to get the final photo, which is why our tropical-themed shower curtain is in the background of the second shot. As you can see from the photos, the scope arrived a bit out of collimation. That wasn’t a huge deal for the kind of low-power scanning that I got the scope for, but it probably did degrade lunar and planetary images somewhat. I can tell you that after collimation, it does better. I got a mesmerizingly good view of Jupiter Saturday night at the Salton Sea, with gently ruffled belts and zones marching all the way to the poles, like the layers of crust in a good baklava. But that’s a story for another time. You are currently browsing the 10 Minute Astronomy blog archives for the day Monday, March 20th, 2017.